Over 100 people were displaced after fire torn through two separate housing complexes located just over 10 miles apart. The first fire ignited around 1:20 p.m., March 23 on the second floor of an apartment complex at 376 Larkfield Road in East Northport, fire officials said. East Northport firefighters arrived to find heavy smoke in the small attic space above the second floor apartments, according to fire officials. Fire officials said firefighters were confronted by an intense fire driven by high winds. According to the National Weather Service, wind gusted to 47 mph on March 23. Fire officials said it took about 100 firefighters from East Northport, Northport, Commack, Greenlawn, Centerport, Kings Park and Dix Hills an hour and 28 minutes to bring the blaze under control. East Northport Chief Dan Flanagan was in charge of the operation. One firefighter suffered a shoulder injury battling the blaze and was taken to Huntington Hospital. None of the building’s residents were injured, but approximately 100 people had to be evacuated, according to fire officials. Many of those displaced were children, said Laura Palacios of the non-profit Friends of Huntington Station Latin Quarter. She said many of the families displaced by the fire are staying in a hotel that is paid for until April 1, but will soon need to find another place to live. Palacios said Friends of Huntington Station Latin Quarter began collecting donations for the victims of the fire after learning children from two families who benefited from the non-profit’s annual toy drive were among those displaced. She said many of the families are under-privileged and participate in the East Northport Head Start program. Finding new housing is the most pressing issue for many of these families, and Palacios said Friends of Huntington Station Latin Quarter is collecting donations of cash, checks or gift cards to King Kullen, Stop & Shop, Marshalls or Old Navy to help them get back on their feet. 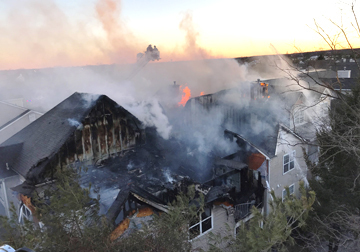 The second fire Saturday broke out at around 6 p.m. in the Avalon Court complex in Melville. Fire officials said flames were shooting through the roof of the building and spreading rapidly when Melville firefighters arrived on the scene. The fire was also driven by Saturday’s gusting winds. Melville Assistant Fire Chief David Kaplan was forced to call over 120 firefighters from 12 departments to the scene in order to finally bring the raging blaze under control. Firefighters were at the housing complex for five hours to make sure the fire was completely extinguished, according to fire officials. Fire officials said 17 units in the Avalon Court complex were heavily damaged by fire, smoke and water, and 52 residents were displaced from their homes. Fire officials said one child was treated and released from Good Samaritan Hospital in West Islip after suffering burns to the arm. Two firefighters also suffered shoulder injuries battling the blaze. One was taken to Plainview Hospital and the other was treated at the scene. The Huntington Town Fire Marshal and the Suffolk Police Arson Squad are investigating both fires.